Marita Burger was born and raised in Wadsworth, Ohio. An only child, she began her formal training in art at the age of thirteen when her mother arranged for her to take art lessons as well as vocal instruction. She performed as a singer quite frequently while in high school and, upon graduation, took a job in a physician’s office in Euclid, OH. In 1949, she married Alan Burger and had four children with him. Initially, she was content to be a homemaker; as her children matured, however, she began to pursue a career in the visual arts more vigorously. She and Alan divorced in the late 1970’s after which she moved to Florida for eight years, only to eventually return to Cleveland and remarry Alan. Marita studied art at the University of Akron and the Cleveland Institute of Art. Among the teachers who most influenced her were Shirley Aley Campbell, Chris Pekoc, and Maxine Masterfied. The emerging artist she began showing her art in shows and art festivals in Euclid, OH and Cleveland. Among the galleries at which she exhibited were A ‘Bella in Berea, From Skilled Hands in North Royalton, the Newman Gallery on Mayfield Road, and Michaelangelo’s in Strongsville. 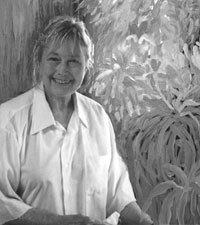 A prolific artist who sold art frequently, Marita’s works are in private collections in Arizona, Florida, Indiana, Michigan, California, Texas, and in many Ohio homes and businesses. Marita said that her early artistic influences included the work of Van Gogh for his color and texture, Monet for his mastering of water-images, and Turner for the freedom she discovered in his soft “sweeps and swipes”. She excelled in a variety of media, including realistic drawings, mixed media collage, paper sculpture, and acrylic painting that featured brilliant colors. She became a Signature Member of the National Collage Society.